This science fiction novel is entitled black box and is available for purchase in paperback and Kindle at Amazon.com. 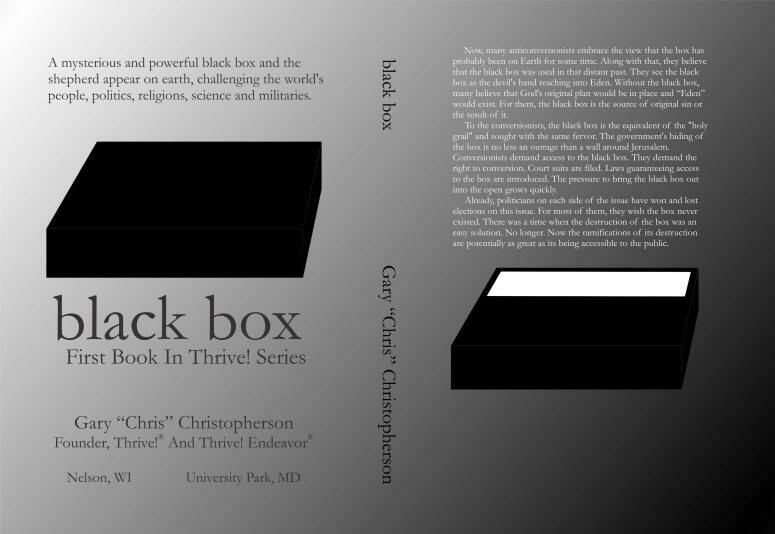 black box is the first volume in what is intended to be the Thrive! series. This sci-fi series explores a mysterious and powerful black box and its enormous impact on the world's people and their politics, religions, science and militaries. "Conversionists" and "anti-conversionists" engage in aggressive struggle for the black box's potentially unlimited power and the human race's future. Moving amongst them is the quiet shepherd, keeper of the black box and the vision of Earth's survival and thriving future. The anticonversionists' rallying call was "destruction," complete destruction of the black box. For them, the box was not only a threat for what it could do, but was being blamed for much of the world's past and current evil. Many anticonversionists came to embrace the view that the box was on Earth for some time. Along with that, they now believed that the black box was used in that distant past. They saw the black box as the devil's hand reaching into Eden. Without the black box, many believed that God's original plan would still be in place and Eden would still exist. The black box was the source of original sin or the result of it. To conversionists, the black box was the equivalent of the "holy grail" and sought with the same fervor. Government's hiding of the box was seen as no less an outrage than a wall around Jerusalem or Christ's crucifixion. They demanded the right to conversion. Court suits were filed. Laws guaranteeing access to the box were introduced. The pressure to bring the black box out into the open grew quickly. Politicians were scared. Already, politicians on each side of the issue won and lost elections on this issue. Most of them wished the box never existed. But it did. There was a time when the destruction of the box was an easy solution. No longer. Now the ramifications of its destruction were potentially as great as its being accessible to the public.